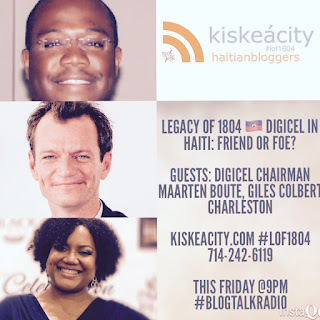 This Friday at 9PM, join me as I welcome Digicel Chairman Maarten Boute and last week's guest Giles Colbert Charleston of Association of Haitian Professionals (AHP) to debate Digicel's impact in Haiti today. We'll discuss Digicel and the Haitian telecom market, specifically issues of competition, Digicel's (failed) attempt to block VoIPs, quality of service and various grievances about Digicel increasingly expressed by Haitians. Also, did Digicel meddle with the last presidential elections? Giles Colbert Charleston agreed to come back to the show to debate what he meant when he said last week that Digicel is acting increasingly as a monopolistic actor in Haiti. This show was spurred by Digicel chairman Maarten Boute reaching out to me to take exception to this statement and asking for a chance to respond. Join us for this promising debate! Make sure to send us questions or join us live with them. See pre-and post show notes and highlights at kiskeacity.com. You can listen live or archived at the player below or at http://www.blogtalkradio.com/pancaribbean/2017/02/04/legacy-of-1804-digicel-in-haiti-friend-or-foe-lof1804. You canPOST-SHOW HIGHLIGHTS: also listen live at 714-242-6119.